Otherwise known as Red Elm, Moose Elm, or Indian Elm, Slippery Elm was a survival food used by early American settlers and even George Washington and his troops during the winter at Valley Forge. Also used as a poultice for the skin, Slippery Elm is most widely known for its benefits to the digestive system. 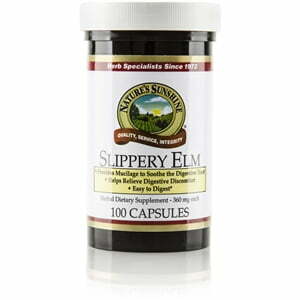 The mucilage contained in slippery elm turns into slippery substance when water is added and may provide relief to the throat and digestive tract. 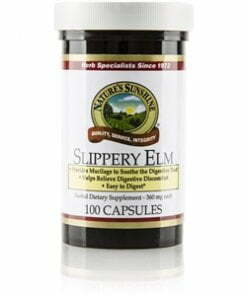 Nature’s Sunshine Slippery Elm comes in 360 mg capsules. Magnesium stearate (vegetable), silicon dioxide (powdered silica), gelatin and water.